The slamming of a screen door, once a common sound throughout the country side and in every neighborhood has, like the pops and clicks of old vinyl records, mostly been replaced with newer technology. 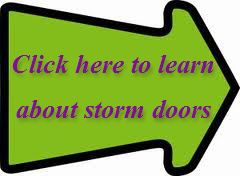 In this age of ever more energy efficient homes the controlled hiss of modern storm doors closing are barely audible. Indeed storm doors are now an integral feature in most homes, providing protection from the elements and enhancing their curb appeal. But for those of us old enough to remember a simpler time, the iconic sound of a closing screen door is synonymous with the many happy memories of days gone by. And lets face it, no matter how energy efficient storm doors become they are unlikely to inspire lyrics comparable to “Our song is the slamming screen door by” Taylor Swift or Thunder Road’s, “The screen door slams, Mary’s dress sways” by Bruce Springsteen. Whether for nostalgia, economy or changing trends screen doors are making a comeback. Nothing compares to the sounds, wafting into the kitchen on a morning breeze, of birds chirping and children playing in the back yard. Many new homes feature screen porches or patios complete with a screen door and it is not uncommon for home owners to choose a screen door instead of a storm door for exterior kitchen doors or even the front door. But unlike many of the old sagging doors of yesteryear the modern screen door takes full advantage of modern production and materials technology. 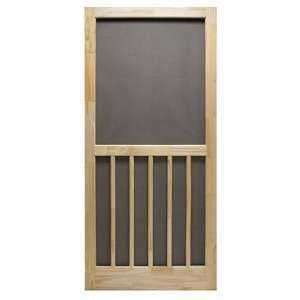 Modern screen doors are available in traditional wood, solid PVC (vinyl) and aluminum. Though technically not doors, there are also some free hanging and retractable screen options available from entry door all the way up to garage door size. Nothing beats a wooden screen door for a traditional look. They can be stained or painted any color to match or accent your home and modern wooden screen doors are made of treated wood so they won’t decay like the one on grand dad’s house did. A wide selection of hinges, latches and closure options are available to suit any taste. Some of the negatives associated with wooden screen doors include, tedious painting and staining, the possibility of warping or sagging over time and difficulty in replacing the screen should it be torn. 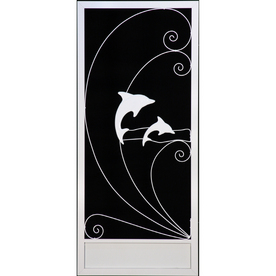 Screen doors made of PVC (vinyl) are easy to install in a variety of locations. They can be custom trimmed to fit odd size or out of square openings with ease and installing the hinges, springs and latch hardware is the same as on wooden doors. There are several styles to choose from all of which feature spline-in-grove screen retention making screen replacement a breeze. A definite problem with some of the more open designs is a tendency to sag over time due to inadequate rigidity of the vinyl frame. Other negatives include only one color option (white) unless painted, which is not recommended, and a somewhat flimsy feel when opening and closing the door. 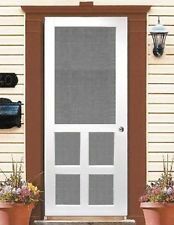 One of the most durable and maintenance free options for a screen door is aluminum. With solid construction and a light weight design, sagging and warping are not an issue. Combine that with multiple color and hardware options along with solid manufacturers warranties and it is easy to see why aluminum screen doors are a favorite choice. Although aluminum screen doors are more expensive than wood or vinyl screen doors, their long term durability and maintenance free construction make them a better investment over time. Additionally options range from standard full screen to lower kick plate or half screen models with a plethora of shapes and patterns to choose from. For pet owners not only will the lower kick plate options prevent screen tearing but models with doggie doors are also available. This entry was posted in Exterior Maintenance, Screen and Glass Rooms, Windows & Doors and tagged screen doors, Screen porch, Screen Room. Bookmark the permalink. 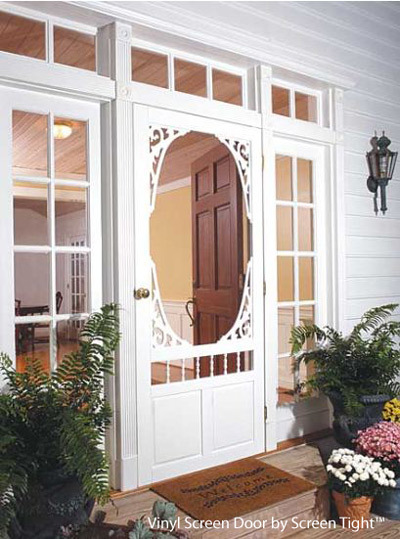 Thanks for this great info on screen doors! Can you tell me where to find aluminum screen doors? I’m not having any luck! Thanks! We are glad you enjoyed our post. Lowes should have a selection of aluminum screen doors available through special order. 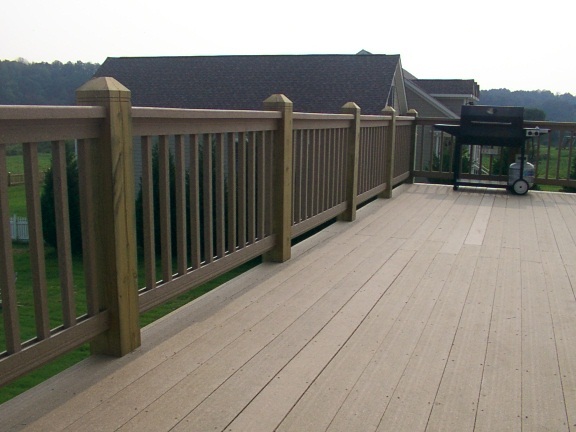 Another and perhaps better place to check is vinyl siding suppliers, which cater to the wholesale market but will usually be happy to assist homeowners as well. Not only do they usually have a good selection of screen and storm doors but can likely refer a professional to install it as well.